Currently, my kids are obsessed with the movie The Greatest Showman. It's the music, I think, as evidenced by them commanding Alexa to play the soundtrack essentially nonstop. It's a good movie - I've always been a Hugh Jackman fan (who isn't?) and as much as ten-years-ago me would mock current me for saying it, Zac Efron got some talent. If you're not familiar, it's the story of PT Barnum and how he built his circus empire. One of his tricks: kinda massaging the truth a little, to kinda hoodwink the paying customer a little. Like, for instance, having the "world's tallest man" already be an abnormally tall guy, but then putting him on stilts. Or having the "world's largest man" shove a few pillows under his clothes for a little dramatic effect. In a way, it's kinda an innocent playful deception, which most people knew but were willing to be lured in any way by the show and spectacle of it. 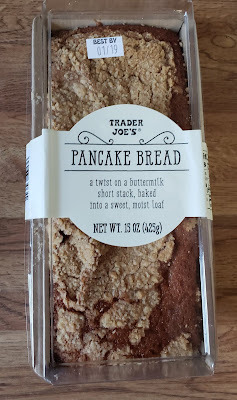 All this brings me to Trader Joe's Pancake Bread. In a world full of carbo-crossovers, most involving pretzels or crosissants (but never pretzels AND croissants - c'mon now! ), we now have this. Pancakes and bread, together, in perfect harmony, right? How did it take so long for this to be a thing? Be honest though. Close your eyes. Forget the label that says "pancake bread." Take a taste. Does it really taste like pancakes? Really? Be honest. To me, nah. Blindfolded, I'd say it tastes more like a soft cinnamon bread than anything else. All the crumblies on top is more brown sugar, etc than anything else. To be fair, there is a maple essence as well. It's soft and crumbly and a little moist and definitely, and not more rugged or dense like a banana bread. The bread makes an excellent snack, a quick breakfast, would be delicios warmed or eaten straight from the container...but it's more bread than a pancake. Slap the name "Pancake Bread" on it....okay, now that it's been suggested, I can see it. Of course, if it were to be named "Soft Cinnamon Maple Bread", while being more apt a descriptor, that's not nearly as exciting. I mean, it'd take me years to buy it probably. But embellish the truth a smidge in some backroom marketing meeting, call it pancake bread - voila! Take the world by storm! This is why I don't work in marketing. For the record, Sandy disagrees with me. "It tastes just like a pancake with a lot of syrup kinda drenched in," she said. It should be noted that she enjoys her pancakes with a small puddle of syrup on the side which she daintily dips her pancake bites in, so she'd know what a syrup-logged pancake would actually taste and feel like is beyond me. Other online reviews I've seen claim the TJ's pancake bread tastes just like a buttermilk pancake. I can see where it's all coming from, but it's overstating the facts in my lonesome, sure to be unpopular opinion. Regardless, the pancakesque loaf is delicious and kinda intoxicating in its carby-comfort ways. I love it. I just wish it were more honest with itself. If Hugh Jackman PT Barnum can, so can this bread, right? My only downvote is for the slight deception of purported pure pancakeyness. Matching fours from the wife and me. I tried it and it's pretty yummy! It did taste kind of a pancake with syrup. It nice change for coffee cake. Ihop could release pancake bread that would be a interesting take. At the TJs near me they were demoing this bread along with "vanilla infused maple syrup" and the two together were fantastic!! Sandy probably knows what pancakes drenched in syrup are like because she has experienced them and has committed her life to avoiding a repeat experience - or maybe that’s just me! I try to make conscious choices at tjs rather than succumbing to the marketing, but I’m going to pick up a loaf when they have it in stock at my store. This review makes me really miss the pretzel croissants that were a thing at TJ's for about a minute. I still look for them every time I go in. Everyone has been raving about this. I usually shy away from the baked goods at TJs because I'd rather get something fresh from my local bakery. Anywho, while I enjoyed the flavor of this I'm not sure I completely "got it". Like, I'm unsure why this product needed to exist. Glad I had it once but can't see myself needing it again. Pretzel Croissants are like the best carby treat EVER. City Bakery in NYC, and another one out here in California, make these dark, luscious, pretzel-y sensations -- a croissant which is treated with the same method as dark pretzels before baking -- with a sprinkle of coarse salt, and it's hard not to gobble them down right at the bakery stand. I have no shame, and they are my favorite croissant ever.